Lee Holmes’ early exit from Pompey was a mutual decision, according to boss Andy Awford. 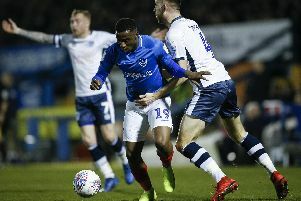 The 27-year-old winger will not head back to Fratton Park after his loan expires on January 3 so has been allowed to return to Preston early. The former Southampton wide man started three games but was replaced at half-time in the 2-0 defeat to AFC Wimbledon and only appeared as a late substitute in the 1-1 draw at Luton. But after discussions with Holmes, both parties felt it was best to go their separate ways. Awford explained: ‘I spoke to him yesterday and it was a joint thing really. ‘If you are going to go on loan, you need to be playing and I couldn’t guarantee that. ‘He understood that so we decided it was best to end it. ‘We’re grateful to him and Preston but it hasn’t quite gone as swimmingly as we wanted it to. ‘He did okay but if you are spending money on a loan player, they need to be in the team more often than not. Holmes joins fellow loanees Matt Fish and Alex Wynter in departing the club. But the Blues boss has still to reveal his plans on Paul Robinson, Miles Storey and Marcus Bean. Awford said: ‘I will be speaking to all three of them in the next few days. ‘We are in no rush. Their loans don’t finish until the first week in January. ‘But it was different with Lee because he lives up north, whereas the others are more local.